As creative professionals, we are always looking for inspiration and trending topics. At Array, we look everywhere for motivation by getting out of the office and expanding our daily routines to get the juices flowing. Whether it be researching online or in store, reading literature or by attending engagements, we foster creative thinking by doing. 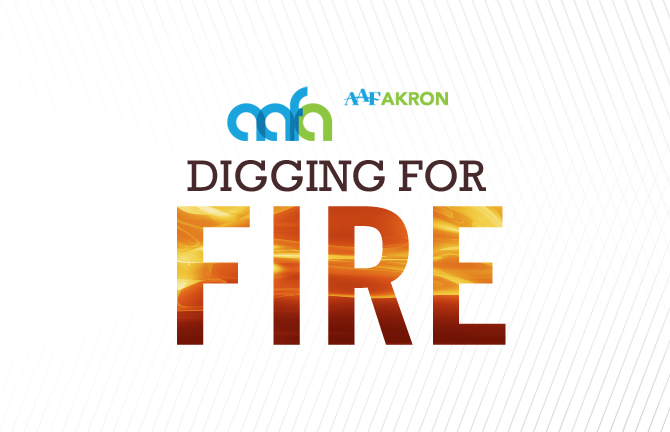 Last Thursday, a few Array team members attended the lunch and learn ‘Digging for Fire’ held at Musica and hosted by the Akron Advertising Federation (AFF). Adam Garcia, founder and director of The Pressure studio in Portland, Oregon, presented a talk about creative business and inspiration. He believes that our job as creatives is to, “help people think, create and communicate.” Often the client needs guidance to help them feel and make a choice. Exploration, surprise, wonder and openness are keys to Garcia’s work. Next to daily projects, The Pressure also does projects of passion. They explore things they really care about and bring an idea from conception to fruition. For instance, they decided to create an exhibition for a science-fiction world called Gemira. They created characters, fabrics for their costumes, wrote a plot and even designed a lettering system. The gallery took place just this past year, and because of its creativity and unique concept, The Pressure has been contacted to design for a TV series coming out soon. Proof that being passionate about what you do really can create new and unseen opportunities! Keep and eye out for projects that we are passionate about. We are lucky to be working with Akron Children’s Hospital for Hope Lights the Way, an event to honor, celebrate and remember those who have been touched by cancer. Join us at the hospital campus October 7th and check back on our blog for an event recap!